This is a typical view of the trail. 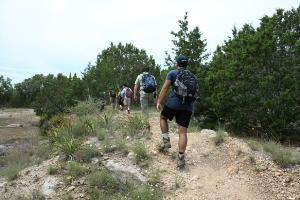 I hiked Pace Bend as a part of a group and, frankly, I was a little disappointed. There wasn't a lot to see or to take photos of. I had hoped to see more views of Lake Travis, but there weren't many, although we did have lunch on some high cliffs that did provide a nice view. Most of the trails are rocky, so it is advisable to wear good footwear and/or use hiking poles for support/balance. The trails are shared with mountain bikers, so you have to be on the lookout. Most of the trails are numbered, but some trails were missing signs. The trail map they provide you at the park entrance is fairly accurate, but there are some places where the map is either outdated or incomplete. The $10/vehicle entrance fee seemed high to me for a county park, but it gained us free admission to the Hamilton Pool, which we visited later in the day, since it is also part of the Travis County Park system.